A beautiful back lit kiss for the beautiful bride to be during their sunrise pre-wedding photo session on the Charles Bridge in Prague. To see more of Rose & Alpha's pre wedding pictures please click this link. Who is the best pre-wedding portrait photographer in Prague? Is it the one who shoots dark, moody, 'gothic' type images where the sky is usually black and the couples all tend to do the same pose (spinning and more spinning)? Or is it the one whose images are so colorful, so sweet, where couples are literally jumping in fountains and or lying on roof tops and all the while their images looks very yellow or orange? Or perhaps it is the one whose photos look like paintings and are captured at night? Or the photographer who does not believe in posing couples for up to 8 hours and instead tries to capture them as they explore the city? Who is the best pre wedding photographer in Prague? If you ask 8 people you may possibly get 8 answers. 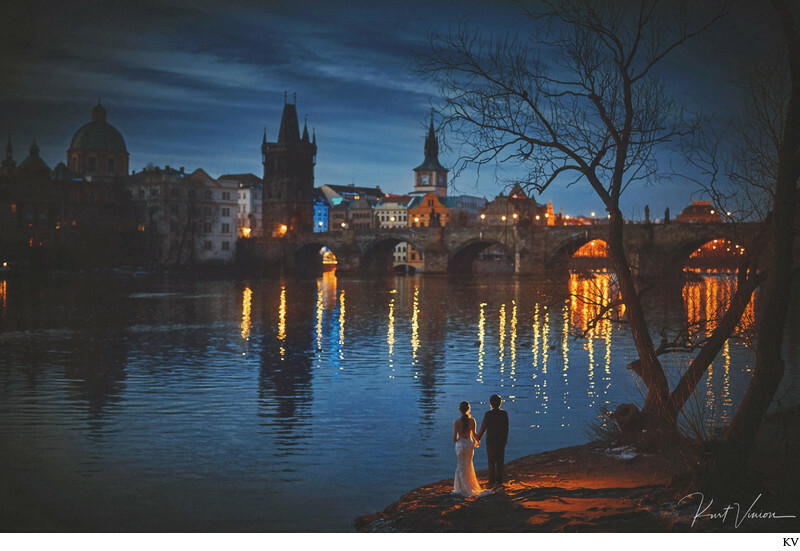 Truth is - there really is no 'BEST' pre wedding photographer in Prague. Reason being - like art , it is completely subjective. Being 'the best' is a marketing gimmick that some use, now being recognized as the best can be an honor but who is giving this honor? Is it a paid organization where the photographer must be a member and only members are considered? Is it an international award community where every photographer is considered? Well, that one does not actually exist. Truth is beautiful pre-wedding photography is subjective - some people prefer BMW's, others prefer Mercedes - while some of us prefer vintage Aston Martin. So how do you know if the photographer you are interested in for your Prague pre-wedding is the best for you? Now that is a real question that should be addressed. First you should ask yourself what kind of images do you wish to have? Do you want everything to be posed where you two just stand and look in to the camera? Or do you want to have a photographer who will work with you to create a style of images that reflects who you are? OR do you prefer a more modern stylish posed session where you two look like models and are posed the entire time - like models? Or a more natural style where the couples seem to be enjoying things naturally? Perhaps you are realizing that having a mixture is ideal as do you really want your images to be in only one style? What about the type of photography? Do you prefer a clean look or do you prefer darker, moodier images? What about skin imperfections? Does your photographer whiten your teeth, your eyes, fix and or remove any skin blemishes, remove wrinkles under your arms, your neck and well anywhere it might pop out such as over the back of the dress? Or does he simply shoot, process in Adobe Lightroom and send the files to you as they are? And what kinds of photography do you wish to have: day time, night time, a mixture of both and do you like natural light, Golden Light? OR all of the above? When selecting your Prague pre-wedding photographer it is important that you research their styles and more importantly see yourselves in their images. If you are not the type of couple who wants to jump in to fountains or spin around for hours and ruin your hair & makeup then photographer 'A' may not be right for you. If you are the kind of person who does not like dark, moody images then photographer B is most likely not right for you. Again, it really depends on your style - some photographers are keen on creating the same images over and over again while others are in to taking more risks, mixing up the styles and etc. The key to having the best pre-wedding photographer in Prague is simply doing your research and then calling them up for a skype or whats ap meeting to see if they fully understand your ideas, your vision and more importantly how well you get along with them. Location: Mostecka 1, Prague 1, Czech Republic.